Need an Arkansas 529 College Investing Plan? Open an account today! 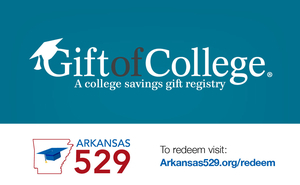 Already have an Arkansas 529 College Investing Plan and ready to redeem your Gift of College Gift Card? You may also call 1-800-587-7301 to purchase a Gift Card today. You are now leaving arkansas529.org and going to an unaffiliated website.